Lachcha Paratha is multi layered paratha. I know that there are lots ways to make perfect lachcha paratha. I want to share few ways to make perfect lachcha paratha. Personally I like to make or follow “Hold like cloth style”(I find it less time consuming). As usual I tried to keep my recipe simple and fewer ingredients. But you can add egg and milk (instead of water) to make it more heavy. I think when light version is so tasty so why make it heavy. Another thing I am using rice flour for sprinkling which I find more effectively holding layers than plain flour. Even fine Semolina and atta are better than plain flour. Now you can follow me in Pininterest. Enjoy. 1. Take ½ cup warm water and mix salt and sugar in it. 2. Sift flour and add salt-sugar water and ¼ cup ghee in it. Mix well. 3. Add water and make into soft dough. Knead well; cover it and keep aside for 30 minutes. 4. Knead the dough again and divide into 12 equal parts. A. Paper fan style: make a flat bread; brush ghee and sprinkle rice flour. Fold like paper fan and then swirl like Swiss roll. Rest it 5 minutes and roll to make paratha with it. B. Hold like cloth: make a thin flat bread; brush ghee and sprinkle rice flour. Hold like a cloth which will make fold in it and then swirl like Swiss roll. Rest it 5 minutes and roll to make paratha with it. C. Make a cone: make a flat bread; brush ghee and sprinkle rice flour. Cut radius; make a cone and start rolling from one side. Press the cone; rest it 5 minutes and roll to make paratha with it. 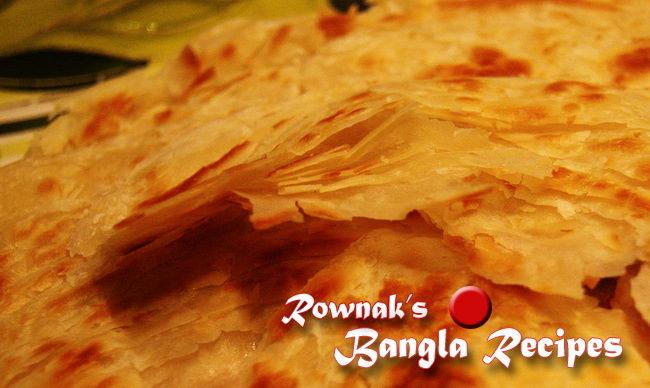 D. For 5 parathas : make 5 flat breads; make a stack with 5 flat bread and brush ghee, sprinkle rice flour between each layer. Roll it and make thin big flat bread. 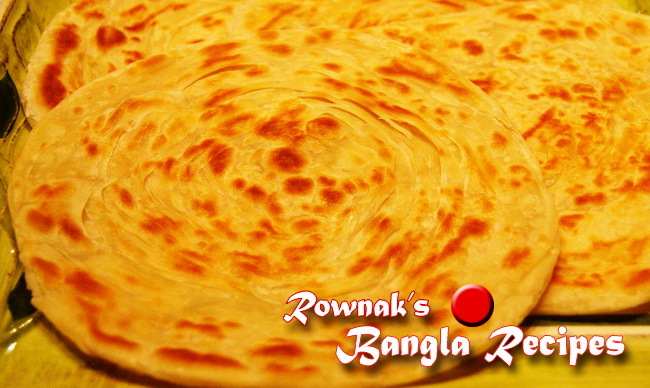 Cut it into ½ or ¾ inch strips and roll these strips like swiss roll (two to three strips needs to make each paratha ). You will get 5-6 swiss rolls and; rest these 5 minutes and roll to make parathas with these. 6. Heat the flat pan over medium heat .When pan is ready, place the paratha over pan, after 30-45 seconds Paratha will start changing the color, turn over Paratha. 7. 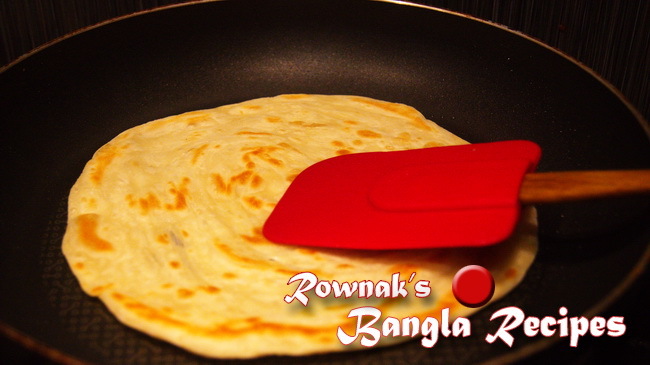 Brush ghee on each side and fry Paratha from both sides pressing with spatula to light brown colour. 8. 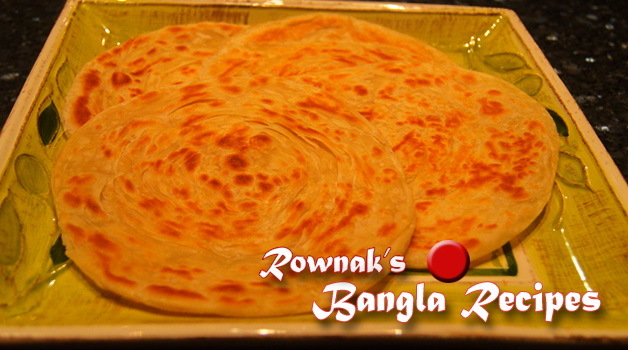 Enjoy Lachcha Paratha hot with your favourite curry. 1. After frying just push paratha with both the hands so that the layers come out. 2. You can add egg and milk (instead of water) to make it more heavy. Thanks Rownak for sharing so many delicious recipies…..